6 off Vuka scooters on their way up country from Cape Town. Three to Bloemfontein and three going to Pietermaritzburg. KLR on its way to Johannesburg and the BMW 1200 GS going up to Durban. Motorbike Transport trip 293 Ready for the trip up to Bloem and PMB. The return trip brings down another full load. KLR to Cape Town form Pretoria, Yamaha 110 and 125 going to PE from JHB. A Jawa 350 going to Struis Bay. HD Softail, KTM 250 and a CB 400 coming into Cape Town for the weekend. 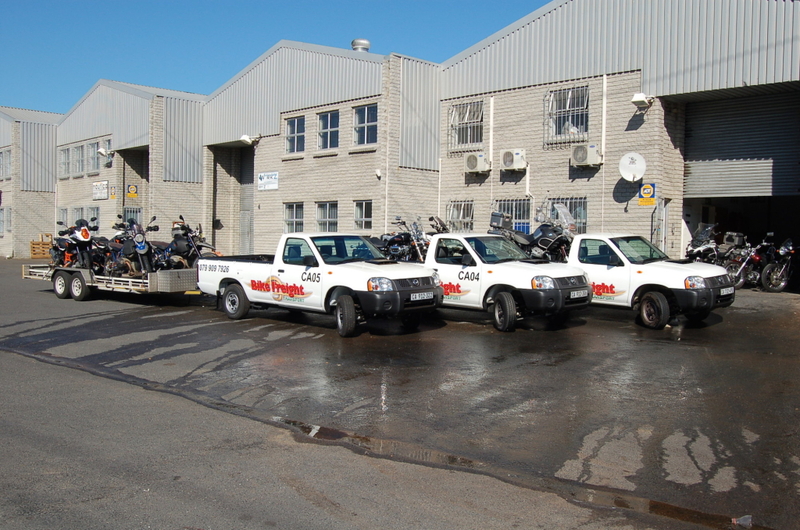 We transport motorcycles, all over SA and Namibia. Multiple weekly, door to door trips. 24 hr sat tracking and the most experienced drivers in the industry. Don’t lose the deal because of unreliable transport service providers, use the best, Bike Freight Transport. We transport all makes and types of motorcycles all over SA and Namibia door to door. Our trucks leave Cape Town around mid week depending on the load and the route. Travelling up the Garden Route to East London with stops on the way in all the major centres. Then either up to Bloemfontein or Durban then onto Johannesburg. We normally spend two days in JHB delivering and collecting stock then head back to Durban and the Garden Route back to Cape Town.